Check out our selection of Dog Boarding, Daycare, and Grooming options. Membership enrollment requires a credit/debit card to be kept on file and charged on the first of every month; there is no cancellation fee or minimum number of months to sign up for. Members must attend at a minimum of two days/week to join the membership program. Daycare at THE DOG LODGE is a great way for canines to interact with other dogs their size and energy level. The attentive staff will oversee the activities while your dog can romp with friends in any number of play yards including the forest covered area high above the ravine, the rolling hillside pasture or the private deck retreat. 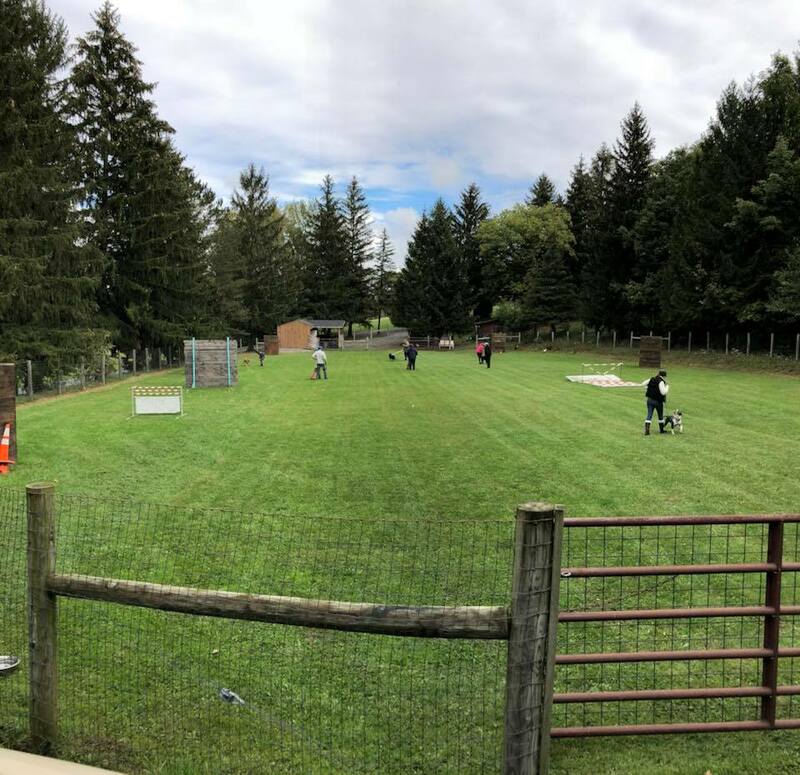 All outdoor daycare areas at this multi-acre facility are safe and secure with 8 foot no climb fencing and professional attendants. The intimate indoor facility is ideal for older or quieter dogs too. Daycare includes play time and exercise, potty breaks and rest. All pets must complete a Daycare Test Day where we will evaluate them for sociability. Schedule your Daycare Test Day by registering with us. Overnight lodging is akin to a resort visit for any dog lucky enough to stay here. Each dog gets their own Dutch Door Private Suite, complete with raised beds, ambiance lighting and more. The opportunity to customize your dog’s visit is what makes their stay here so special. The unique setting of 26 wooded and pastured acres allows you to pick and choose any number of amenities to keep your dog entertained, exercised and happy. All pets must complete a Daycare Test Day before any overnight stay. Schedule your Daycare Test Day by registering with us. Additional play time and exercise is highly recommended for your high-energy or extended stay best friend. Select from the following to make use of the one of a kind, unique setting here at The Dog Lodge. All exercise options are leashed. This 5-star resort experience includes a 15 acre leashed nature walk along a well maintained creek trail. Your dog will thank you for this amazing Adirondack-like experience filled with fun and frolic! The adventurer is amply named for an 8-acre pasture romp over a rolling hillside of tree coverage and lush grass (or seasonal snow). Your dog will love the freedom to explore our farm and all it has to offer. Sights, smells, and the great outdoors! This is one of the favorite, short nature walks around the working farm. This will provide ample exercise along the grassy pathways around our numerous pastures and garden areas. The sights and sounds from this area give your dog lots of new adventures and mental stimulation. Our amazing training field is open for rental to the public. Need to get a training session in or use our agility equipment? Have an event you would like to host? Contact us for more information.